The ULTIMATE all season tyre is here! Introducing the MICHELIN Cross Climate!! New tyre technology designed to operate in ALL weather conditions and ALL temperatures with unfaltering performance and economy. Now available to purchase for year round safety - enquire with us today! The EU has recently passed law for all new cars and light commercial vehicles to be fitted with the eCall tracking device from 2018. Despite earlier protest from certain groups with regards to privacy rights, MEPs state the system will not store user data but only trigger in the event of a collision. All other data will not be stored. The technology is already in use by a number of car manufacturers and is expected to cut emergency response times by up to 50% and save thousands of lives. 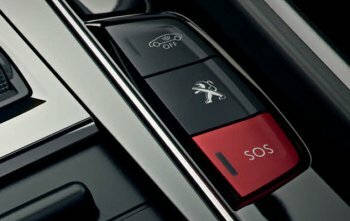 The system will cost around £80 per unit as a factory install and will use the EU wide 112 emergency call service to automatically send the vehicles global coordinates, speed at point of impact and number of occupants. It is triggered by sensors in the vehicle which work in parallel with airbag deployment systems. Once triggered, a message is immediately sent to the nearest emergency service centre. EU members have until 2017 to ensure that the infrastructure to support the system is fully in place and operational. Are the days of free travel coming to an end? Cameras already track our movements across a significant part of the UK. Will anyone truly believe that our personal travel data will be totally secure once compulsory tracking units are installed in our vehicles? George Orwell had it right!! With review sites and questions over review validity a hot topic in the press currently, we thought it a good idea to tell you about our stance and experiences! On our pages you'll find scrolling reviews posted by our customers. Click on the box and you can read the countless feedback reviews we've been receiving over the years too. Each and every single one has been received by us directly from a serviced customer that is 100% traceable and auditable back to original jobs. Where a customer has left a review with a comment that needs addressing we have publicly replied too - for clarity! We have continued to opt out of the third party paid-for subscription services with the exception of the Which? Trusted trader programme. Which? has, for decades, provided a trustworthy, clear and concise platform widely accepted and in itself, wholly trusted by the populous. Reviews are moderated and checked by the organisation prior to listing on their site. Their reputation after all, is too good to tarnish by operating this platform in any other way. We know that not all customers - even those thoroughly pleased by our services - will leave a review. Most in fact, don't. We could all spend far too much of our own time writing reviews for businesses if we elected to do so after every transaction. Unfortunately therefore, some third party review sites reap financial benefit by touting business from competing operations and play them off against each other in order to boast the highest number of reviews. This 'pressure' to rank higher than the opposition could therefore lead to reviews that may not be entirely genuine. Paid for review sites may also elect not to publish less than perfect reviews - at risk of losing a valuable client of course. If you're baffled by all the options and considerations but are looking for a mobile tyre service - try us. Proof is always in the pudding and we'd very much like to receive and publish genuine feedback from you! Well certainly modern motorsport seems to indicate that it's now all about tyre technology. From F1™ to MotoGP™, tyres are playing a defining role when it comes to team strategy and more importantly, winning races. Lewis Hamilton once again proved this weekend in Bahrain that while a championship winning driver needs to be able to outshine the rest, he also needs to play a careful management exercise of his rubber - anticipating degradation throughout the course of the race and determining best usage. Motorcycle supremo Valentine Rossi and the Yamaha factory team also proved to the world this weekend that both experience and the correct tyre choice provided the winning formula. What does all this mean to us, the everyday motorist? Actually quite a lot. The racing purists would naturally prefer to just see out and out wheel to wheel combat throughout any series, but technology moves on relentlessly. Most manufacturers showcase themselves in these sports to achieve not just publicity but to sell their products and also to ensure they remain at the forefront of advancing technology. What better way to do so than at the ultimate test of endurance and speed? Modern vehicles are now full of systems, safety and developments that were first introduced and tested in motorsport often five or ten years beforehand. We can therefore anticipate that tyre technology will take another huge leap forward in the coming years and lead significant improvements for us all. This has to be good news for the motorist because lets face it, nobody really wants to buy new tyres, and we all want them to last twice as long but provide even better fuel economy while perfoming at higher speeds with ever more grip! So next time a race is a bit dull to watch, consider the difference in your own car from the one you were driving 15 years ago. Fundamentally cars haven't changed - neither have our roads much - but the car has - big time! From winter back to summer tyres and a cautionary note! The current very warm spell should generally prompt most motorists who haven't already done so to consider swapping back onto summer rubber over the next couple of weeks. We're still experiencing chilly mornings and after dark, but daytime temperatures have now started to reach the teens and subsequently better operating 'windows' for all season and summer type tyres. Our dedicated mobile fleet work with countless customers countrywide who enjoy the benefit of having the simplest solution to swapping over tyres seasonally. Book us to your door at the specific time and date of your choosing. Be aware also that warmer weather and improved road temperatures can give rise to much better traction for you. This may also mask tyres with very low tread - so take a couple of minutes while it's dry and warm to give yours the once over. Are you hitting the roads this bank holiday? If so, expect regular long delays and tailbacks heading into the popular destinations and be prepared! 1. Well, you'd have guessed we start with this! Check your tyres BEFORE you leave. Tread and pressures all round and don't forget the SPARE iof you have one. You'll be pretty disappointed to pick up a puncture only to find the spare flat too! 2. Oil and water and brake fluid level checks. These are two minute checks that could highlight potential issues before you get going. 3. Keep your fuel tank topped up - no good being stuck in long, slow moving traffic with that dreaded low fuel light glowing. 4. Give the glass a good clean on the inside (newspaper and window cleaner works a treat!). A car full of grumpy people sat in traffic in the rain soon gives rise to condensation. Dirty greasy glass takes much longer to clear not to mention see through! 5. Make sure you have plenty of distracting entertainment for the kids. Take yourself a set of headphones too to avoid listening to 'Let it go' for three hours! Whatever your plans, stay safe this holiday. We're available from Tuesday to attend to your punctures/blowouts and worn tyre issues! First the science: Piezoelectricity is charge that is built up in crystalline and ceramic structures when exposed to a mechanical force. Such a material that is squeezed rapidly will create a charging voltage. 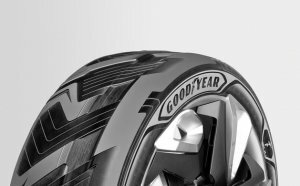 With huge technological advances in hybrid electric vehicles and the ever increasing range and popularity of electric powered cars, Goodyear have been getting inventive. Recently released at the Geneva Motor Show, Goodyears BH03 concept tyre is fitted with piezoelectirc materials that covert heat and movement into reusable energy to continuously charge an electric motor! Clever stuff. What's more the tyre is produced in a deep black colour to absorb as much sunlight as possible. Another potential tyre upgrade that we will likely see in the future will be one which allows for multiple pressure cells within a tyre that react (inflate or deflate automatically via an internal pump) to differing driving and road conditions in order to maximise comfort, economy and wear. For the full range of Goodyear tyres available for your car, call us today or input your tyre details above. 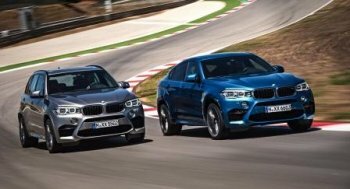 BMW have announced Michelin as the sole supplier for the 21" fitment sizes for the new X5 & X6 M-Sport models. Following two years worth of rigorous testing, the Pilot Super Sport will be fitted to the optional 21" forged alloys. The ultra-high performance tyres are supplied in two sizes for front and rear - 285/35ZR21 & 325/30ZR21 and provide the highest levels of traction and performance possible for a road car. The new products will be made available in line with the launch of both vehicles this year. Prices are scary! Hometyre mobile technicians fit new tyres across the entire BMW range including Run Flat options up to 24". Call us for more information now. Is this the future of F1™? WE certainly hope so! 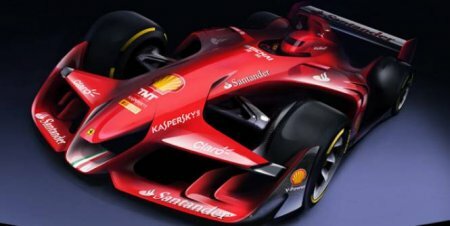 Ferrari concept designers believe current and short term changes to the sport will steer future designs into this much meatier and more aggressive look. 18" wheel designs have already been tested and it's widely anticipated that these will soon be a feature on the modern F1™ cars in favour of the long term use of 13" rims and tyres. Manufacturers involve themselves in the sport not just for the glamour and associated marketing but to aid development of systems and safety for future road cars - tested at the ultimate level. In one of the first cases of what appears to be a national clampdown on part worn tyre traders, Lincolnshire based Moss Tyres proprietor Luke McKenzie has been found unanimously guilty by jury on 16 accounts of being in possession to supply dangerous products to consumers. Specifically relating to the sale of unsafe used tyres, the defendant faces up to 12 months in prison along with a £20000.00 fine. Part worn tyre retailers have grown in numbers across the UK since the start of the recession - preying on the innocence of motorists who believe they would be buying a safe product at a discounted price. The reality in many cases however is that unsuspecting motorists are simply buying discarded tyres that are unfit for use for varying reasons and actually paying a higher price per usable mm of tread. Motorists should always ask themselves a very simple question before considering the purchase of used tyres: - "when have you ever needlessly replaced the tyres on your car?" The answer is ALWAYS "never". This applies to motorists the world over - Germany included! Tyres are almost only ever replaced when they are worn out, old and perished, or have suffered unrepairable damage. Economy brand new tyres represent far better value for money than a used tyre. If you are buying to a budget, call us now for further assistance. We have a huge range of tyres available to suit all pockets. Tyres are so often sadly overlooked as a safety feature. The reality is that your tyres literally save your life every time you drive your vehicle. Is it really worth reducing the odds with someone else's reject tyres? While many UK motorists have converted to our mobile tyre services over the years, our Scandinavian friends over in Sweden have as yet not had this level of service offered to them - until now! The service is about to be trialed in Malmo through some very keen individuals who already have the benefit of operating a local tyre shop. In Scandinavian countries, the use of winter tyres is a legal requirement for certain periods of the year and this leads to huge demand for services at fixed sites at the first signs of snow, and again when the mercury rises. A pre-booked premium mobile service to allow motorists to store their winter/summer tyres at home (or work) and have them fitted at a known date and time in advance should prove very popular. Once people experience the mobile fitting service once, they'll no doubt call back for routine replacement and repair too! The first service vehicle left the UK shores mid February and should begin trading very soon. The team have opted to stick with a right-hand drive vehicle already equipped with winter tyres. We didn't know this, but despite driving on the left, many delivery type vans over there are right hand drive to allow for easier and safer kerbside access for drivers - pretty intelligent thinking! It may still be chilly but those early signs of spring are thankfully upon us already! Lighter nights and daytime temperatures just starting to nudge towards double figures again. Ok, we may still be hit with a cold hard spell but with March rapidly approaching, now is a good time to start making plans to prepare your leisure vehicle for the forthcoming season ahead. A long winter lay-up can cause numerous issues for your vehicle. Prevention is always better than cure (and usually less costly!) but we're all guilty of forgetfulness and leading busy lives. 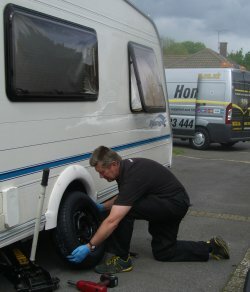 For caravans the most obvious issues are with brakes and tyres. Brakes are best serviced annually prior to first use by a professional repairer. Tyres need to be thoroughly examined before hooking up for holiday. Remember that rubber is a natural product and ages from the date of manufacture. A tyre that is five years old or more will have become harder and suffer more rapidly from exposure to ultra-violet light (sunlight) and low level ozone. This has the effect of 'drying' out the rubber and causing it to split and crack. Don't forget also that your tyres may have been sat in the same position for many months on end too. A tyre is manufactured using steel belts for rigidity. These will naturally distort with prolonged spells with weight placed upon them. If you hook up the caravan and drive off without checking the pressures first, you will place enormous strain on the casing of the tyres and potentially cause a blow-out. Not a great experience when you're all set for relaxation. Have you considered the benefits of TYRON bands? Read more about this great safety device here. If you're looking for very high quality security products, check out our range from UK manufacturer Bulldog. available to buy mail order direct to your door. It's always good to pick up accreditation and acknowledgement for our efforts. 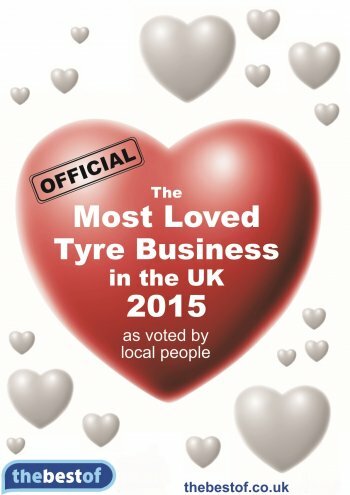 We try very hard to get things right for everyone at all times and it appears that visitors to the national Best of website recognise us as a service worthy of voting into number one spot for 'Most Loved Tyre Business in the UK'! Heartfelt thank you to our brilliant customers - and we hope to welcome in more of the same! It may seem a little early to be testing summer tyres - but not for GTU - the German vehicle inspection organisation! A comparison test of a dozen tyres across the very popular 205/55R16 size lists the Goodyear Efficient Grip Performance as the stand out tyre. With other brands also achieving a 'highly recommended' status. The tests have also shown that even the lesser known brand have noticeable improvements on quality from last years tests. Good news for all motorists! 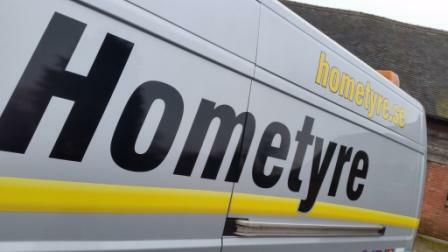 Hometyre supply and fit the full range of Goodyear Efficient Grip Performance tyres - and all other leading brands too. Call us for more information. The F1™ governing body is set to make sweeping changes to the sport from 2017 onwards. With the quieter and far less ostentatious current V6 engines comes universal disappointment in the overall thrill of a Grand Prix race. The high-pitched scream of an F1™ car has been replaced with a pleasant but far less exciting rumble. The current tyre situation is also set to change. With the Pirelli contract nearing its conclusion. 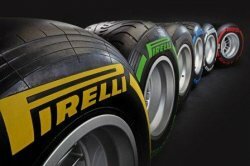 the Italian tyre giant is keen to move into the next generation of the sport. Already testing has taken place to replace the longstanding 13" tyres with a much larger 18" variety. A greatly reduced sidewall height is much more in-keeping with the modern road car and will allow for massive technological breakthroughs to pass down from the top of the sport to the street motorists. In order to keep up with the increased power to the wheels, the rear tyres are also set to get much wider too. Expect significant bodywork changes to accommodate engines and tyres! Nokian claim a global first! Nordic tyre manufacturer Nokian has claimed the coveted title of the world's first A energy rated winter tyre. Designed initially specifically for the new BMW i3 electric tyre, the cold weather tyre experts will now continue with developments for further sizes. According to tests, the Nokian Hakkapeliitta R2 can reduce the rolling resistance of electric vehicles by up to a further 30%. The energy savings gained from the lower rolling resistance increase the vehicle's range. Tyre sizes for electric cars are very different to what we've grown accustomed to. The Nokian Hakkap winter comes in size 155/70R19 84 Q. Narrow tyres with very large wheels and low profiles are set to become the norm. For city and extra urben use, these tyres dramatically reduce rolling resistance with a very small contact patch with the road surface. For club motorsport enthusiasts and drivers of ludicrously fast road cars alike, the news from Japanese manufacturer TOYO is that the all new R888 tyre - the R888R will soon be available to buy in the UK. Making its launch at the Autosport show this month, the semi slick tyre has been approved for road use as well as for high speed track fun. "Produced in 32 sizes initially, the new Proxes R888R takes track steering and grip to another level. With a fast warm up time, increased dry grip and sustained performance over multiple laps and heat cycles, the Proxes R888R is the ultimate track tire. A rayon 'super-high' turn up ply on some sizes, combined with steel side plies, give the new Proxes R888R precise steering response and feedback to the driver allowing them full control of their race car to optimize its performance." The Proxes R888R stands alone amongst its competition in allowing competitors to drive to and from race day venues. As stock arrive into the UK, Hometyre mobile fitters will be able to supply and fit the range at your home or work address. Wishes all of our existing clients and future new ones a fun and safe evening and a very happy new year for 2015. 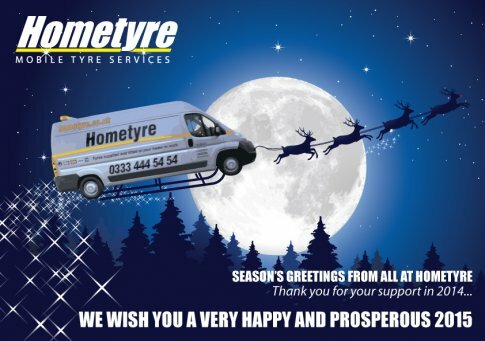 Hometyre HQ and all of our franchise network would like to thank every one of our customers and suppliers alike for the ongoing support throughout 2014. We're continuing to steadily grow and are currently experiencing a record December - even in the absence of really bad weather! We look forward to a prosperous 2015 and hope to further expand our customer base the length and breadth of the UK through our dedication to customer service. 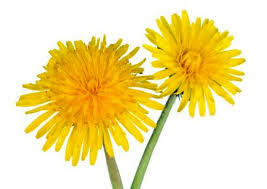 German tyre giant, Continental has produced the first test tyre, the Continental WinterContact TS 850P, using dandelion rubber. Yes, you've read that correctly! The material, called Taraxagum™ provides Continental with an important step in its aspiration for the industrialisation of dandelion rubber in tyre production and to make tyre production more sustainable and less dependent on traditional raw materials.